In its overview of CPUs, even Intel skips past the 80186 and 80188. It isn’t really significant to personal computing. A few accelerators used it, but as far as I know the Tandy 2000 was the only desktop PC ever designed around the 80186. 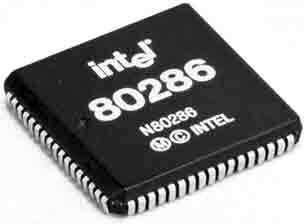 The 80286 was the first Intel x86 CPU with built-in memory management. In contrast to the 3 micron, 29,000 transistor design of the 8086, the more powerful ‘286 has a 1.5 micron design containing 134,000 transistors. Byte magazine (May 1993) notes that the 6 MHz 80286 has a MIPS (million instructions per second) rating of 1.2 – and 2.66 for the 12.5 MHz version. The earlier 8086 had a MIPS score of about 0.07 per MHz of CPU speed, compared with about 0.21 for the ‘286, making the newer CPU approximately 3x as powerful at the same MHz rating, although we must keep in mind that MIPS is not an accurate pedictor of real world CPU performance. Overall, it’s safe to say the 286 was at least twice as powerful as the 8086. The 6 MHz 80286 was the heart of the 1984 IBM PC/AT, which also introduced a 16-bit motherboard and 16-bit expansion bus to the PC world. However, despite new addressing modes available with the 286, it typically ran in real mode, which is compatible with the older 8086, leaving it generally working more quickly but with the same 640 KB memory limit. Running in protected mode allows the 286 to address a lot more 64 KB segments, but it had the same problems using data structures over 64K as the 8086/88. Some operating systems, including OS/2 and Windows/286, take advantage of the more advanced memory models available to the 286.